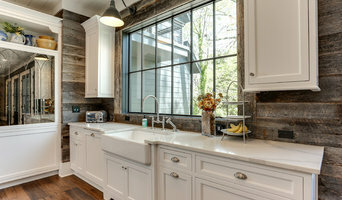 Wake County's Elite Kitchen and Bath Gallery Best of Houzz 2014-2018! The Kitchen & Bath Showroom is a cabinetry dealer selling four cabinetry lines, as well as countertops, tile, decorative hardware, and furniture-style vanities and islands. We offer decorating and design services by our certified kitchen and bath specialists. Additional services include complete contracting and renovations by licensed general contractors - Contractor Management Services of NC. Kitchen & Bath Galleries is a full service kitchen and bath showroom, offering design, product, and installation. Come visit us and browse our vignettes, or give us a call to schedule a consultation! See below and/or check out our webpage for a list of our showroom locations. JeanE Kitchen and Bath Design, Inc.
Senior Designer at Kitchen & Bath Galleries of North Hills Although I am originally from Atlanta, North Carolina has been my home since 1994. Second to being a mom, kitchen and bath design is my passion. I enjoy the challenge of creating a beautiful space that is within your budget. Remodeling Contractor specializing in kitchen and bath remodeling in and around the Raleigh NC area. DHR is a Wake Forest, North Carolina Company specializing in kitchen and bath renovations and home building. For years, DHR has catered to all professional remodelers and home builders. DHR also offers home site consultations bringing the showroom to the home or office for the convenience of our customers. Together they have the experience and knowledge to make your dreams a reality. You can be assured DHR has an experienced team committed to helping you make the most of the your investment. Entrust DHR to guide every aspect of your renovation project, from design to planning, to budgeting and construction. You have found your General Contractor! Over the past 30 years, We've helped over 1,000 homeowners just like YOU create the kitchen and bath they love to live in We give you Exceptional Space Planning & organizational ideas, Quality products, Detailed Craftsmanship done faster. We offer 3-D Rendering of your kitchen or bath to help you Visualize what the space will look like when done. Video: <a rel="nofollow" target="_blank" href="https://www.youtube.com/watch?v=eU-r2RV7G-A&feature=youtu.be">https://www.youtube.com/watch?v=eU-r2RV7G-A&feature=youtu.be</a> Kitchen Design & Remodeling, Custom tile Backsplashes and more. Over 20 years experience. Licensed, Bonded, Insured. Why do I need a professional who specializes in kitchen and bathroom renovation and design in Wake Forest, NC? While looking for Wake Forest, NC bathroom remodeling contractors or kitchen renovation experts you may often find professionals who specialize in both rooms. This is because these space have a lot in common. Kitchens and bathrooms include an abundance of fixtures that require careful planning and installation, including sinks, faucets, tubs and toilets that all need water hookups and drainage. They also use similar materials, such as tile and stone for countertops and flooring, due to the nature of their use. So it makes sense that professionals who works on the kitchen remodel and design also works on the bathroom construction or redesign. What do Wake Forest, NC kitchen designers or bathroom remodel professionals do? Bathroom designers, as well as kitchen designers in Wake Forest, NC, are constantly staying on top of trends in the ever-changing industry. The designers know the best layout for your room, and can configure the layout for optimal functionality and utilization of the space. In the kitchen, the refrigerator, stove, and sink should be laid out in relation to one another, and it should be seamless and easy to move from one to the other. A kitchen and bathroom designer in Wake Forest, NC will know how to work with a contractor and architect to plan the flow of the room to work best for your needs. Most bath & kitchen renovations involve architectural plans from page to reality; these contractors are also trained to provide design services so that you don’t have to hire a separate pro. Like a general contractor, a Wake Forest, NC kitchen and bathroom remodeling contractor is responsible for hiring and supervising subcontractors and providing materials when necessary. Find a bathroom and kitchen designers and renovator on Houzz. Narrow your search in the Find Pros section of the website to bathroom and kitchen designers in Wake Forest, NC. You may also look through photos of spaces to find kitchens or bathrooms you like, then contact the bathroom or kitchen designer who worked on it.